LAPEL, Ind. – In November, the United States will have a chance to look toward the heavens and see what some are projecting to be one of the brightest comets ever witnessed, Comet ISON. But for those in Howard County, they need to look no further than Greentown to find one of the greatest groups of Comets to ever dress in Eastern green – the 2013 Lapel Regional champions. On Feb. 16, the No. 6-ranked Lady Comets defeated No. 14 Wabash 48-32 to claim a berth in the Class 2A Final Four at the Northern Semi-State hosted by Warsaw High School. Eastern head coach Jeremy Dexter called the regional championship, “Very satisfying. Against Wabash, Eastern jumped to an early lead 12-6 lead after one quarter. But the Lady Apaches put the game in slow motion as they attempted to disrupt the aggressive and quick Lady Comets defense. The tactic worked and Eastern held a slim 23-18 at the half. But the second half was a different story as the Lady Comets controlled the pace. Brittany scored four unanswered points to increase the lead to 27-20. And at the 4:12 mark of the second quarter Bethany Neeley stole a pass and cruised coast-to-coast for an uncontested layup, forcing a Wabash timeout as Eastern led 30-20. “We struggled in the first half to defend them, but came out more aggressive in the second half,” said Dexter. By the time the third quarter Comet blitz ended, they held a 35-25 lead that seemed more like a 20 point advantage. With 2:45 left in the game, Eastern held a 14-point lead and the Comet faithful in the stands started to come to life as they realized the squad was headed to the Final Four. Brittany led Eastern with 15 points and eight rebounds while twin sister Bethany scored 14 points and grabbed 10 rebounds. Taylor Holliday nearly had a double-double as she finished with 14 points while nabbing nine boards. Sarah Puckett led Wabash with 10 points. Eastern advances to play in the Class 2A Northern Semi-State at Warsaw High School on Saturday. The Comets play No. 14 Fort Wayne Bishop Luers (14-11), a six-time IHSAA state champion, for the right to play in the state championship the following weekend in Terre Haute. Game time is set for 4 p.m. 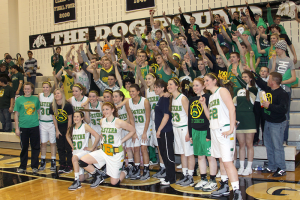 The South Semi-State features the top two teams in Class 2A – defending state champion and No. 1-ranked Evansville Mater Dei (26-2) and No. 2 Heritage Christian (24-2). Eastern is the lone public school remaining in Class 2A. The second game at Warsaw is the Class 4A Northern Semi-State between No. 11 Fort Wayne South Side (23-3) and No. 8 Warsaw (24-1). Admission is $8, which is good for both Warsaw Semi-State games. For additional coverage on Eastern’s regional championship and upcoming trip to the semi-state, see the Feb. 19 issue of the Sports Journal of Central Indiana. This entry was posted in Eastern, IHSAA. Bookmark the permalink.